Robb McCalmon, Roy Robinson Subaru General Sales Manager, with the Tulalip Foundation display. You may recall a heartwarming TV commercial from last year’s holiday season where several families and individuals sang a cover of the popular song, Put a Little Love in Your Heart. Towards the end of the commercial it was revealed to be an advertisement for Subaru, with a message of spreading love throughout the local communities of America. The company stated that for every new Subaru sold or leased during the holidays, they would donate $250 to the purchaser’s choice of charity, for a campaign known as the annual Subaru Share the Love event. Their latest television spotlight showcases that over the past ten years, Subaru donated approximately $140 million through Share the Love, claiming the money raised help protect over one hundred National Parks, rescue over 50,000 animals, deliver over 2 million meals to elders across America and grant 1,800 wishes for youth living with life-threatening illnesses; donating the funds to the National Park Foundation, American Society for the Prevention of Cruelty to Animals (ASPCA), Meals on Wheels America and Make-A-Wish Foundation respectively. In 2013, Subaru afforded each dealership the opportunity to choose a local charity or non-profit as a fifth option for their customers to choose from each year. 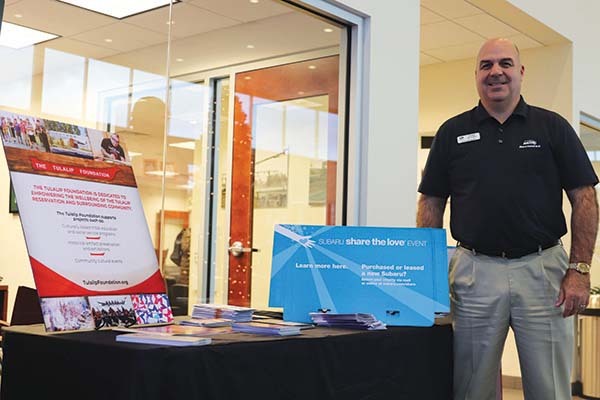 Out of six hundred and thirty dealerships nationwide, six hundred and twenty-eight participate in the Share the Love event annually, including the friendly crew at Marysville Roy Robinson Subaru. The Tulalip Foundation is a non-profit organization that’s been dedicated to empowering the wellbeing of the Tulalip reservation and surrounding communities since 2007. The Foundation works with a number of programs to create a brighter future for the tribe; programs that are based on three important values to many tribal families: education, culture and justice. The organization originally began as a way to raise the remaining million dollars needed to open the Hibulb Cultural Center. Since the museum’s opening, the Foundation has raised money, accepted donations and applied for a number of grants to provide several programs and departments with money for events, incentives and services including the Betty J. Taylor Early Learning Academy Parent Committee, Tulalip Office of Civil Legal Aid, Tulalip TERO Vocational Training Center and the Tulalip Veteran’s Quilt Project. Additionally, the Foundation also hosts a number of fundraisers throughout the year such as the Hibulb Cultural Center Salmon Bake and the Foundation’s annual Giving Tuesday event. In recent years, the Share the Love event has generated upwards of $40,000 each year at the Marysville dealership, a number that Robb is hoping to match but Nicole and the Foundation isn’t necessarily anticipating, stating she’s happily thankful for whatever amount is raised. Because the final donation remains to be unknown until the end of the event, the Tulalip Foundation Board of Trustees will determine how the donation is distributed once the total is revealed. Robb ensures that his crew is dedicated to working hard this holiday season, with a goal of delivering a ‘big check’ to the foundation. Roy Robinson also created an information kiosk located inside the dealership so people buying or leasing a new car can learn more about the Tulalip Foundation when determining which of the five charities they can select. The Tulalip Foundation is assisting with the upcoming Betty J. Taylor Early Learning Academy Christmas Concert & Silent Auction and is also raising funds for the Tulalip Veteran’s Quilt Project by selling hand painted stone pendants, created by Tulalip Artist David Spencer Sr., at the Hibulb Cultural Center gift shop. For more information, please visit Marysville Roy Robinson Subaru or contact the Tulalip Foundation at (360) 716-5400.